This is the next in a new continuing series about development in Ocean Beach, the Precise Plan, the OB Planning Board and such other incendiary concepts. OCEAN BEACH, CA. Have you heard of the OB Planning Board? Meeting monthly, the Board is the official body – made up of local residents, property owners and businesses – that advises the City of San Diego on development and construction projects and issues slated for Ocean Beach. And it’s the closest thing to an elected body for OB. While it meets in the OB Rec Center on Santa Monica, the Planning Board is supposed to ensure that the Precise Plan – OB’s urban design plan – is followed by developers, home and apartment/condo-builders – and the City. This Precise Plan – rewritten in the mid-Seventies – was a populist and green planning manifesto for the community that was way before its time. It contained provisions and dictates that slowed the building frenzy, and enacted rules that new development had to follow – conforming to the wishes of the community. But that’s for later. The new Board was instituted in 1976 under the dictates of the new revised plan. Ever since the Board’s members have been – and still are – elected at yearly public elections. The Precise Plan? Planning Board? What the heck? What are you talking about? Ah, my friend, that is the jest of the story. 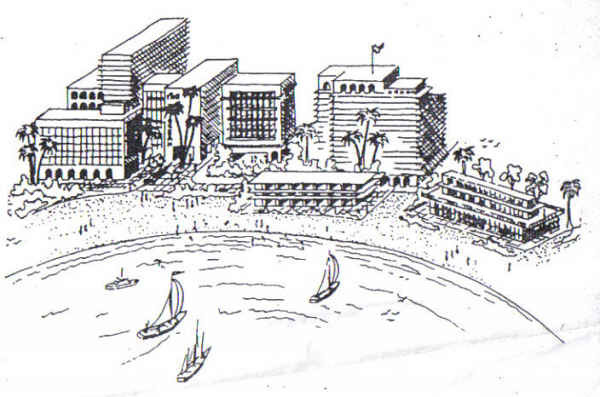 It is a story about how some rich and influential people put together an original design plan for our beach community back in the late sixties and early seventies. Their plan, formalized by a City Planning Dept document, called the Ocean Beach Precise Plan, called for a tourist mecca and a high-rise playground for the high-rolling. 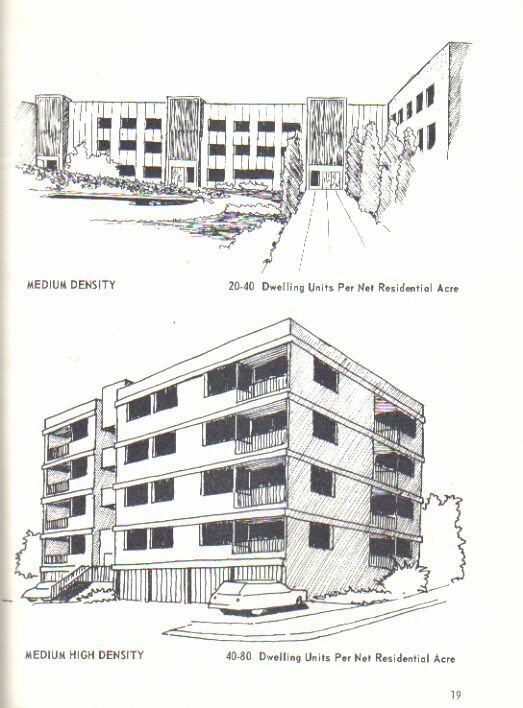 Graphics of typical apartment construction sanctioned by the early Peninsula Community Plan. You have to remember that these were the days before many building restrictions, before the 30 foot height limitation, before access to the coastline was an issue, and when the infantile environmental movement was just blossoming. And it’s quite a story, a great history – although you couldn’t tell by looking at the History or About pages on today’s OB Planning Board’s website. So we need an overview, with the devilish details to follow in this and more segments of the story. 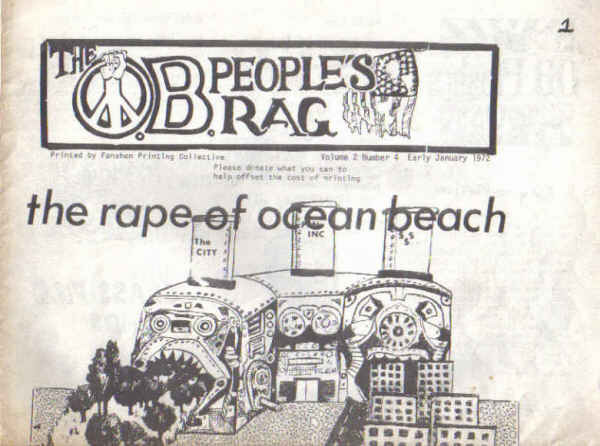 By the late Sixties and early Seventies, Ocean Beach faced a planning crisis. As the small, college beach town morphed from a surfer haven into the Haight-Ashbury of San Diego, a deeper transformation threatened the very foundation of the Bohemian paradise. On one hand, planning and quality of life issues, like congestion, traffic, lack of parking, and an unbridled spurt of apartment-building were beginning to chisel away at the traditional great reasons for living in Ocean Beach. On the other hand, the only people that were dealing with these issues – if at all – was a small, unrepresentative band of the financial and power elite. 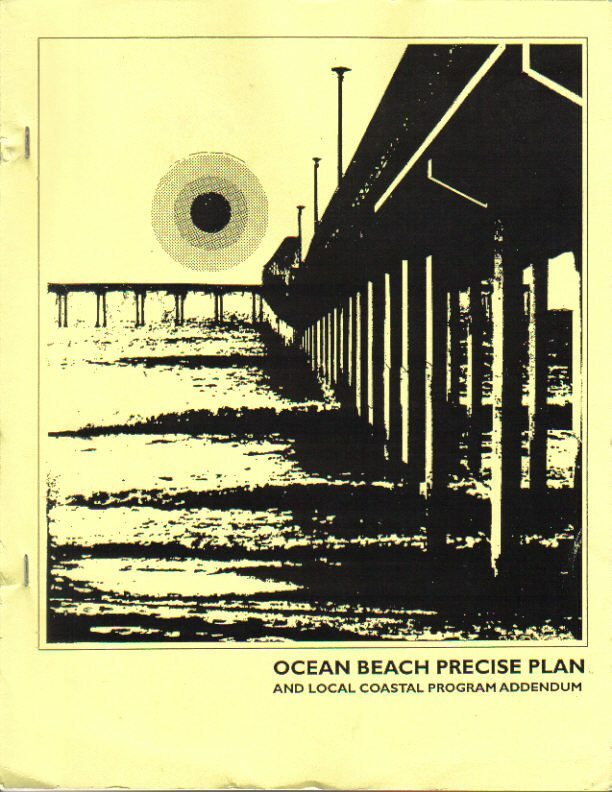 And their design plan for OB was a horrible roadmap for people and beachtown removal. If implemented, it would have drastically changed the face of the community – details below – by forcing out lower-income residents and by allowing high-rise, expensive night-clubs, and other tourist-oriented changes to OB’s waterfront. The future of Ocean Beach as envisoned by Peninsulans, Inc. Yes, this was the time before the thirty-foot height limit and other building restrictions. Developers didn’t have to conform to any special floor-area-ratios, so they were building giant ugly boxes with virtually no side or back yards to maximize the units they could rent out. It was a scary time for those who lived at the beach and who cared about their community. High-rises were going up in Mission Beach, just a stone’s throw north. Three-four story apartments were going up in OB. There weren’t any restrictions on curb-cuts, so OB was losing street parking. More and more people were moving in to fill up all the new apartments, as insufficient zoning restrictions allowed unlimited population growth and the accompanying congestion, increased density, traffic, less access to the beaches and cliffs, less views. The apartment building frenzy threatened the tranquility of the community and the low-key lifestyles of its residents. Residents and small home-owners began to see the beauty of OB slip away. As large apartments on the cliffs were built, the issue of coastal access began to emerge. Demands for limits on high-rise were being heard. But no one seemed to be listening. The community was indeed in crisis. And then along came Peninsulans, Incorporated. Who were they and where did they come from? Pen. Inc., as it was called, born in the mid-Sixties, represented the local Establishment’s answer to unchecked development. This was the birth of the modern era of development on the Peninsula, the neck of land that protrudes like a great ship out into the Pacific, with slumbering crews from the communities of Point Loma, Ocean Beach, and Loma Portal. For many years, beginning in 1869 with the very first sub-division recorded in Loma Portal, greater Point Loma was developed as a residential community, a bedroom community for San Diego. This developmental pattern held, with the more beautiful, scenic sections of Point Loma, becoming estates for the very rich. 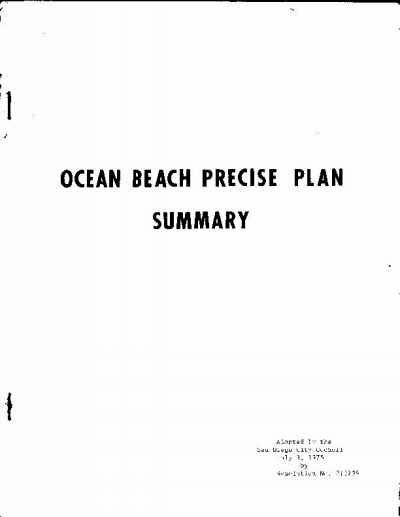 Meanwhile, Ocean Beach was developing as a low-rent beach resort. (See posts on early OB developers.) Other than that, development over the decades was slow but consistent. That is, until the economic climate improved and local financial forces clamored for new areas to develop beginning in the late fifties. And there was much futile ground throughout the Peninsula. During the war years, the forties, the Peninsula was covered with two-story wood military housing. What’s now the Sports Arena area, for instance, was packed with these temporary living quarters, buildings that would fall like matchsticks in front of the bulldozer after the War. From the fifties on – ideas and money on developing the Peninsula flowed like the sea around it. Mission Bay to the north had been dredged and was being converted into a huge waterland park, one of the largest inland bays on the California coast. Shelter Island to the east had been created out of mud flats – and hotels, restaurants, marinas, and boat-yards were being constructed. Mission Valley was under construction as the new freeway was being poured and the new malls were enabled. It was a developer’s heyday, in many ways. Little restrictions, no local nimby planning panels. Lots of construction. Apartments started going up in Ocean Beach. Up to the War, OB had been primarily a summer resort town. With the war came the demand for housing, and many beach shacks were converted into more substantial units. And with apartments, the beachtown started looking like a regular neighborhood. Yet development across the Peninsula was haphazard. And nobody was more frustrated with the ways and developments than the local propertied and commercial elite. Point Lomans with money and connections. They had all watched as the malls in Mission Valley had taken their business away. There had been a big fight between downtown interests and the people who wanted to build malls and shopping centers in the Valley. Point Lomans had sat on the sidelines, but were primarily connected to old San Diego money. When the dust settled in the downtown vs Mission Valley brohaha, Mission Valley won. And the mall and what with the completion of I-8 right through the Valley bringing all those customers that much closer, business took off. But the little guys who were left, like the little businesspeople of downtown Point Loma , Midway, and Ocean Beach suffered. Most of them saw their businesses drop, as the newness and glamor of a big shopping mall, where everything was together sucked their customers away. The local monied elite, embedded in the Peninsula Chamber of Commerce, decided the time was to act. The Chamber formed a non-profit to garner recognition and support by the City and other businesses in the area. So, on November 12, 1965 – Pen. Inc was officially formed as a non-profit. 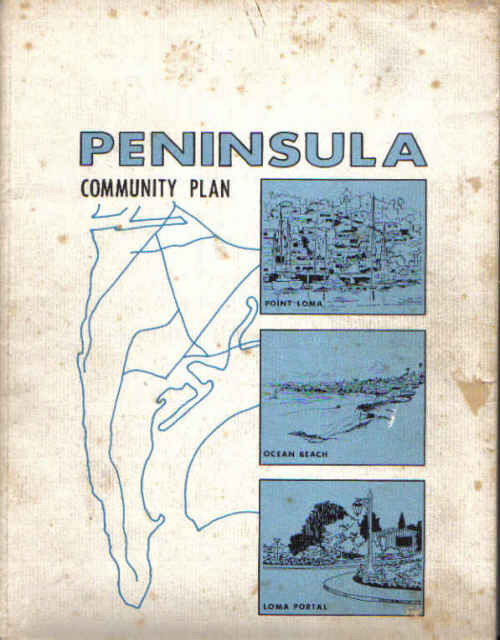 A month later, in December 1965 – the Peninsula Community Plan is officially launched. The San Diego City Council recognized and endorsed Peninsulans, Inc., as the “citizen’s committee” to work with City staff on a development plan for Point Loma and its environs, Ocean Beach, and Loma Portal. Pen Inc would work with the City and produce the Peninsula Community Plan. Pen Inc? Who were these guys? Is this what the OB Rag is turning into – a feel-good blog? No one’s interested in the negative, the serious, the slippery foundation that our sandy culture stands on?